This has been taken as one of the great English versions of Renaissance humanism, an assertion of human dignity over medieval asceticism. Actually, it is within the purest medieval tradition. Hah! Take that those who exalt the Renaissance over all else! Tillyard goes on to add how Shakespeare writes within the medieval “chain of being” tradition, which they derived from the Church fathers. He could have added something about Psalm 8, but we’ll let it slide. Tillyard talks about how he began the book trying to get at the context of Shakespeare, but found that his subject grew on him until he found he had to continually peel back layers of the onion. It’s hard not to gain a kind of fascination and admiration for the medieval view of reality, and this is the book’s real subject. C.S. Lewis tackled the exact same thing in his excellent The Discarded Image. Tillyard’s book lacks the depth and insight of Lewis, but his writing is also much more accessible. I wish I had started with him first. 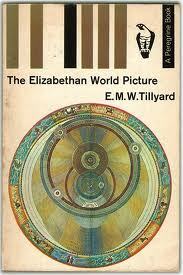 The fact that so much of the book deals with the medieval view of the world rather than strictly the Elizabethan stands as one of Tillyard’s main arguments. Yes, the Reformation broke with certain things from the past, but in the main they kept much of the medieval synthesis intact. The Scientific Revolution, not the Reformation, ended that view of the world. Order and Unity: Everything had its place, everything played a part. In that sense it was crowded, with nothing out of place. But it was purposeful. This is one of things that most separates the Elizabethan from the Victorian world. In the latter there was a general pressure of opinion in favour of the doctrine of progress: the pessimists were in opposition. In the Elizabethan world equal pressure existed on both sides, and the same person could be simultaneously aware of each. In our day, we seem to believe in nothing in particular, though a belief in progress and progress alone would I’m sure be more insufferable. 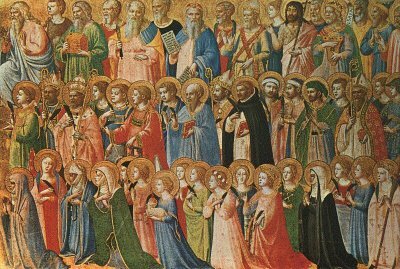 Hierarchy: The “Chain of Being” meant that an infinitely long descending ladder from God down to the creatures far beneath the sea. Earth itself had a rather humble spot on this ladder. But the main feature here were the connections. Air had superiority to earth, and earth to water. Air is linked to water through earth, and so on. The system had many advantages. Tillyard includes many quotes from the period and one immediately realizes how much authors had to work with and build upon. They could know that their audience would understand a multitude of sacred and secular references, and have a shared view of the world. Modern authors have to do so much more work for much less assumed reward. Tolkien had to create an entirely new world to write an epic. Sir Toby Belch: I did think by the excellent constitution of thy leg it was formed under the star of a galliard. Sir Andrew Aguecheek: Ay, tis’ strong, and it does indifferently well in a flame-coloured stock. Shall we set about some revels? Sir A: Taurus: that’s sides and heart. Sir T: No, sir, it is legs and thighs. Characteristically both speakers are made to get the association wrong; and Shakespeare probably knew that to Taurus were assigned neck and throat. There is irony in Sir Toby being right in a way he did not mean. He meant to refer to dancing — legs and thighs — but the drinking implied by neck and throat is just as apt to the proposed revels. The present point is that the serious and ceremonious game of the Middle Ages has degenerated into farce. Who wants to disagree with Sherlock Holmes? But he is wrong — one’s view of the solar system does matter. We have yet to find a workable replacement for Ptolemy and the medievals, and this surely has impacted our cultural life as a whole, and our individual sense of our place in the world. Like Major Tom, we float aimlessly and need to find a place to stand.